This one is a famous scene at the shore of the Ipiranga river, where was declared the Brazil's Independence. The Independence Day of Brazil (Portuguese: Dia da Independência), commonly called Sete de Setembro (English: 7th of September), is a national holiday observed in Brazil on September 7th of every year. The date celebrates Brazil's Declaration of Independence from Portugal on September 7th, 1822. On September 2nd of 1822, a new decree with demands from Lisbon arrived in Rio de Janeiro, while Prince Pedro was in São Paulo. Princess Maria Leopoldina of Austria, acting as Princess Regent, met with Council of Ministers and decided to send her husband the news, along with a letter advising him to proclaim Brazil's independence. The letter reached Prince Pedro on September 7th, 1822. That same day, in a famous scene at the shore of the Ipiranga river, he declared the country's independence, ending 322 years of colonial dominance of Portugal over Brazil. The Ipiranga River is among the most famous Brazilian rivers because it is mentioned in the very first line of the Brazilian National Anthem. The Independence Park (Parque da Independência) — also called Paulista Museum (Museu Paulista) —, where the Emperor Pedro I of Brazil proclaimed the independence of Brazil, exhibits classic architecture and a collection of Brazilian colonial artifacts, and the Zoology Museum, are also located in Ipiranga. Independence Day is a national holiday marked by patriotic displays and military parades are held in all the state capitals, and in many cities throughout the country. Inside Sao Paulo is now on Twitter! 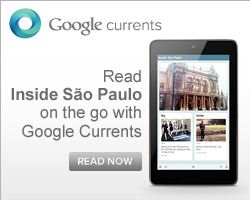 Inside São Paulo is now on Google Currents. Subscribe yourself and find out about this city!